Sure the weather is still going up and down between frigid nights and crisp sunny days, but soon we will be in the thick of the winter with only our outerwear to protect us and maybe an extra layer of insulation if we indulged too much over the holidays. With the beautiful fall weather, if you are like us, you may have also been indulging in a few outside fire-pits and gatherings with friends. Which leaves the worst smoky smell on all your clothes. Meaning everything must be cleaned after a night by the fire outdoors. You will have no choice but to check the tag on you winter coat for care instructions. So while you have been enjoying many outdoor festivities, take a look at these tips to return your winter coats to their proper status. You should expect to have your winter coat cleaned about twice a year; once at the beginning of the season and once at the end before storing away for the Spring and Summer. This will help to maximize the lifespan of you winter-wear. If you check your coat and it says "dry clean only", then it's best to not try to clean it at home. If you find that you stored your coats and jackets without cleaning them first, check the cuffs, collars, and the body for stains and be sure to point these areas out to your professionals at Mark Pressed4Time. Spot clean smaller stains immediately by blotting and not rubbing. Early morning coffee or donut jam can wreck havoc on your coat. Stick to this one rule and you will help to lengthen the life of your warm winter investment. Whether you have a down jacket, leather jacket, or a heavy wool jacket make sure to bring your coats to the experts at Mark Pressed4Time. Remember it is helpful if you take the time to point out where the heavy wear and stains tend to be so that your professionals at Mark Pressed4Time can treat the garment and give a little extra attention to those areas. At Mark Pressed4Time, your cleaning schedule can be set up at your convenience. 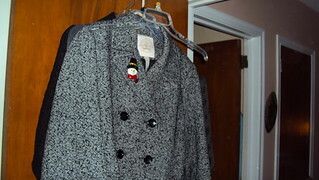 Contact Mark Pressed4Time if you are interested in learning more about dry cleaning services for your winter coat.